The Monk Lazarus of Galeseius was born in Lydia, in the city of Magnesium. As a youth educated and loving God, Lazarus became a monk at the monastery of Saint Sava, the founder of great ascetic piety in Palestine. The monk spent ten years within the walls of the monastery, winning the love and respect of the brethren for his intense monastic effort. 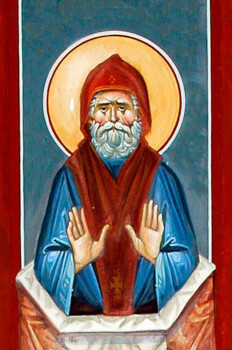 Ordained presbyter by the Jerusalem Patriarch, the Monk Lazarus returned to his native country and settled not far from Ephesus, on desolate Mount Galesius. Here he was granted a wondrous vision: a fiery pillar, rising up to the heavens, was encircled by Angels, singing: “Let God arise and let His enemies be scattered.” On the place where this vision appeared to the saint, he built a church in honour of the Resurrection of Christ and took upon himself the feat of pillar-dwelling. Monks soon began to flock to the great ascetic, thirsting for wise spiritual nourishment by the divinely inspired word and blessed example of the saint. Thus arose a monastery. Having received a revelation about his impeding end, the monk related this to the brethren, but through the tearful prayers of all, the Lord prolonged the earthly life of Saint Lazarus for another fifteen years. The Monk Lazarus died at 72 years of age, in the year 1053. The brethren buried the body of the saint at the pillar upon which he had pursued asceticism. The saint was glorified by many miracles after his death.